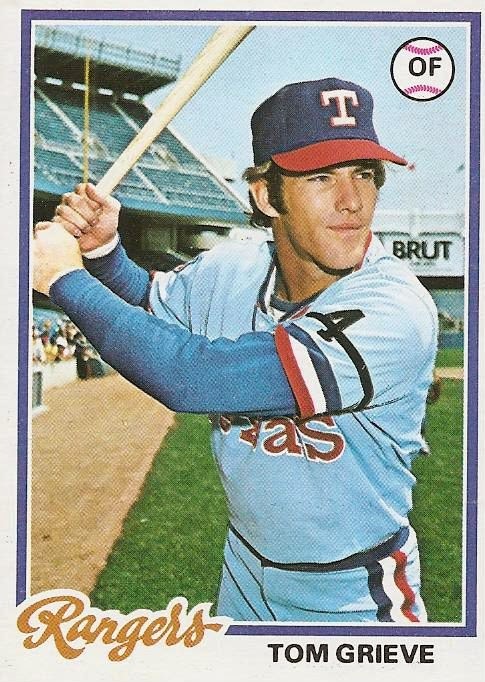 Texas Rangers Cards: 1978 Topps - Tom Grieve. Taking a short break from the 2014 season in review series today. I'll finish it up tomorrow. Going to have another installment in the 1978 team today. Looking at card number 337 of the 1978 Topps set brings back some memories. Just over Tom Grieve's left shoulder is a sign for Brut cologne. Anybody else remember that brand? I haven't seen it since I was a kid. Anyway, on to Tom Grieve. After failing to impress in 1976, Grieve was once again relegated to a backup role in 1977. His bat was missing in action and he was out of chances in Texas. In December of 1977 Tom was included in a huge 4-team trade. As part of the trade, the Rangers sent Grieve to the New York Mets along with a player to be named later. Ken Henderson filled that role in March of 1978. After the trade, Grieve spent one season in New York before being traded to the Cardinals. A partial season in St. Louis and a May 9, 1979 release ended his Major League career. The Rangers re-signed their former number one draft pick as a free agent on May 21, 1979 but Tom never again appeared in a MLB game. His playing days over, it was time for the next step in TAG's career - the front office.